Here's my post from May's guest post at Or So She Says. I posted the picture of Builders & Bulldozers in May here at Blissful Roots, but never the instructions. So, here's the entire post. My twins have been on spring break this past week, and the weather has been so nice! We've been outside a lot these past few days. I love when the weather turns warmer, and you can spend time outside in your backyard playing games (like Builders & Bulldozers). I was required to take an elementary physical education class in college while I was working on my teaching degree at Utah State University. I remember thinking it was a fun class, but a tad bit of a waste. Every school I'd ever attended, or heard of, had a P.E. Specialist. I was going to be a classroom teacher. Why in the world did I need to know how to teach P.E. to my students? Well, less than a year later I was hired as a first grade teacher, and one of my responsibilities was P.E. We didn't have a specialist at our school, so once a week I was teaching my first graders P.E. My elementary physical education class didn't seem like such a waste of time anymore. In fact, I was desperate to find my file from the class (luckily I'd saved it). 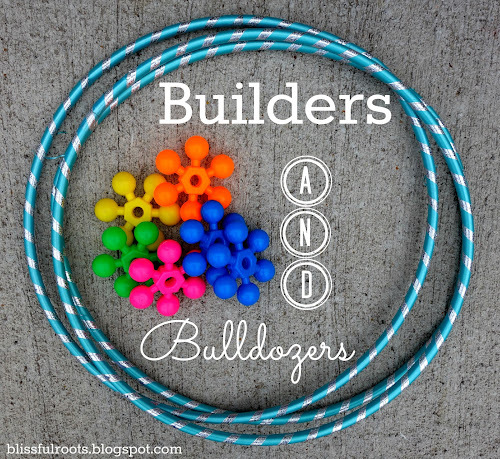 Builders & Bulldozers was my first graders' favorite game to play. I loved it too because it was so simple, and it got my kids moving. Here's how it goes. Scatter the hula hoops all over your playing area (yard, gym, wherever you can find the space). If you have a large group playing, use at least 10-15 hula hoops (more is fine too). If you have just a few small children playing, five hula hoops would be fine. For every hula hoop, you'll need one bean bag. We didn't have bean bags last time we played at my parent's, so we used the flower-shaped linking toys (in the picture above) and they worked great. You really could use anything, but I would discourage using balls. The balls tend to roll all over when you place them outside the hoop. Place half of the bean bags inside the hula hoops, and half outside the hula hoops. I made a little diagram below of how the game would look all set up. The dotted circles are the hula hoops, and the gray squares are the bean bags. Divide the players into two teams. One team will be the builders. 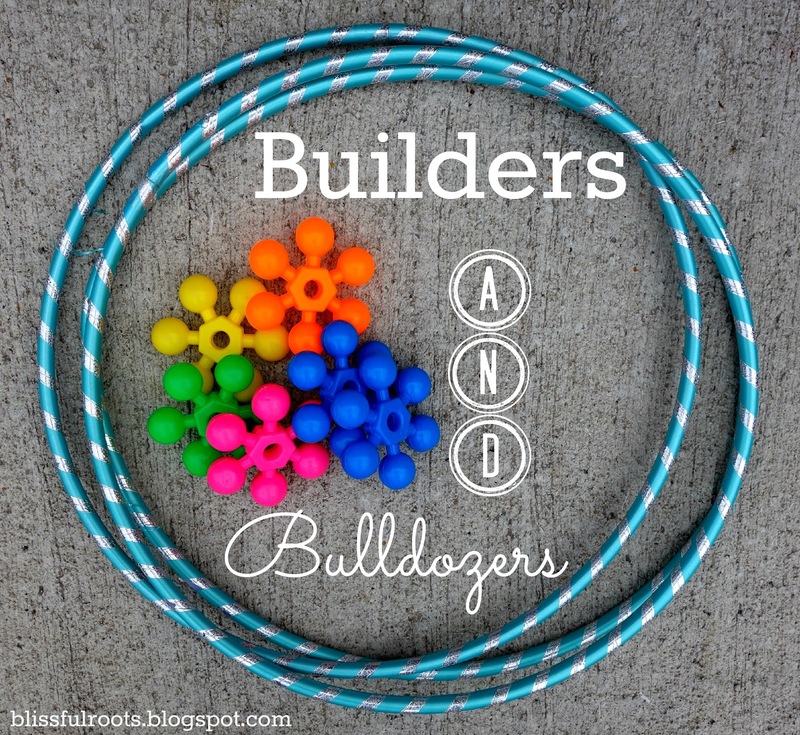 The builders will run around and try to put the bean bags inside the hula hoops. The other team will be the bulldozers. They will run around and try to put the bean bags outside the hula hoops. So simple! When you're ready to play, blow a whistle or say, "Go!" The teams run around either building (putting bean bags inside the hoops) or bulldozing (taking bean bags out of hoops). We always have the rule you can't guard a hoop. It just makes for fewer disagreements in the game. Play for however long you'd like (a few minutes is plenty for one round), and blow your whistle or say, "Stop!" Have all the players put their hands on their heads. Count how many bean bags are inside the hoops, and how many are outside the hoops. If there are more bean bags inside the hoops, the builders win. If there are more bean bags outside the hoops, the bulldozers win. You can play as many rounds as you'd like. It's fun to switch teams every round as well. The builders can be the bulldozers for round two, and the bulldozers can be builders. 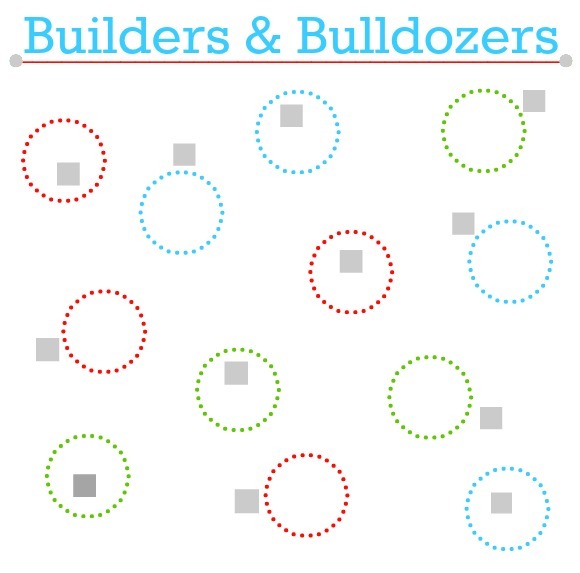 Builders & Bulldozers is the perfect backyard game for family get togethers, or for your own family. I love it because my three boys can play it on their own, or it's perfect for involving the entire family. My husband and I love to take on our three boys. We always end up laughing and laughing, and getting some good exercise in the process. Very impressive article you shared here and I love it. وكذلكً من اكثر مميزات شركتنا والذي يميزها عن غيرها في بعض المؤسسات وهي خدمة تركيب الفرش والاثاث فنحن عملنا لا يتحدد ويتوقف علي نقل العفش والعفش لاغير نحن معك حتى تطمئن على الإطلاقً فنحن لا نتركك حتى تستعيد مركز جميع أمورك فلإتمام الهامة إلى أخر نقطة هامة بها وهي التركيب وفرش العفش وترتيبه فسوف تجد مجموعة عمل شركتنا مع للنهاية حيث سيقوم بتركيب العفش من قام ايضاً بفكه من طليعة الشأن حتي يتم التركيب بأسهل ما يمكن وبدون أي إشكالية ونقوم أيضاًً بادخار مهندسين لعملية فرش العفش حيث يتم فرش البيت بأسلوب ترغب بها وتريد مشاهدتها وتتناسب مع الذوق العام لذلك الوقت.